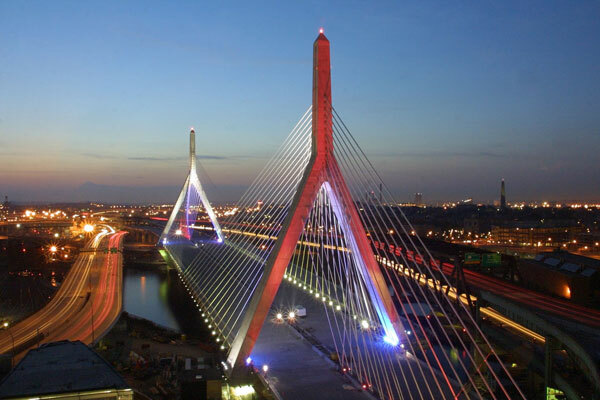 A special event called for special illumination of an iconic symbol of the new Boston. 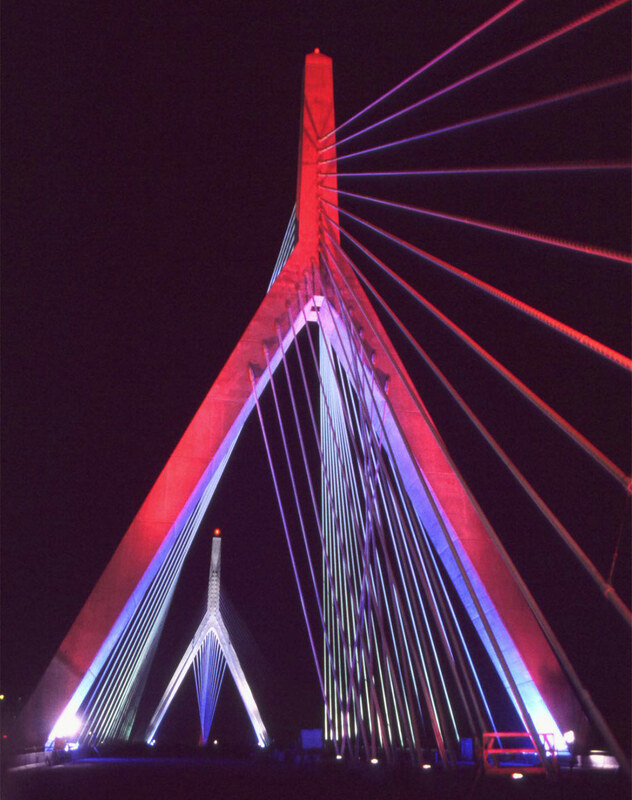 Temporary theatrical fixtures and accessories supplemented the permanent lighting installation to celebrate the opening of the bridge and to observe the first Independence Day after 9/11. This was design on a grand scale, combining elements of architecture, theater, and engineering. The existing scheme for the bridge illuminates the cables with cool white spotlights and the undersides of the towers with blue filtered floodlights. The holiday scheme added metal halide spotlights to illuminate the faces of the towers and colored gels over existing fixtures to tint the light on the backspan cables. Mockups were used to test the design. Gels colored the backspan cables and in the tower mockup, white spotlights lit the mainspan side of each tower and red spots lit the backspan side. This arrangement emphasized the three-part plan of the bridge and allowed all the colors to be seen together from the roadway. The fixture beam spreads were chosen to put most of the light on the towers and minimize spill to the sky, and overlapped to distribute light evenly on the bridge surfaces. The total effect gave the bridge a holiday look from all angles.